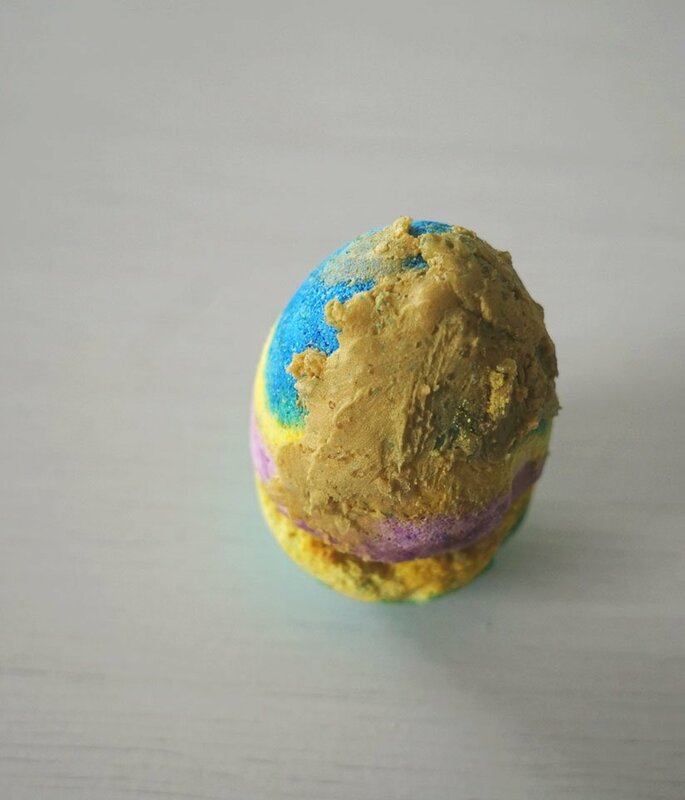 A colorful Easter egg covered in a chunky coat of homemade golden “glitter”! 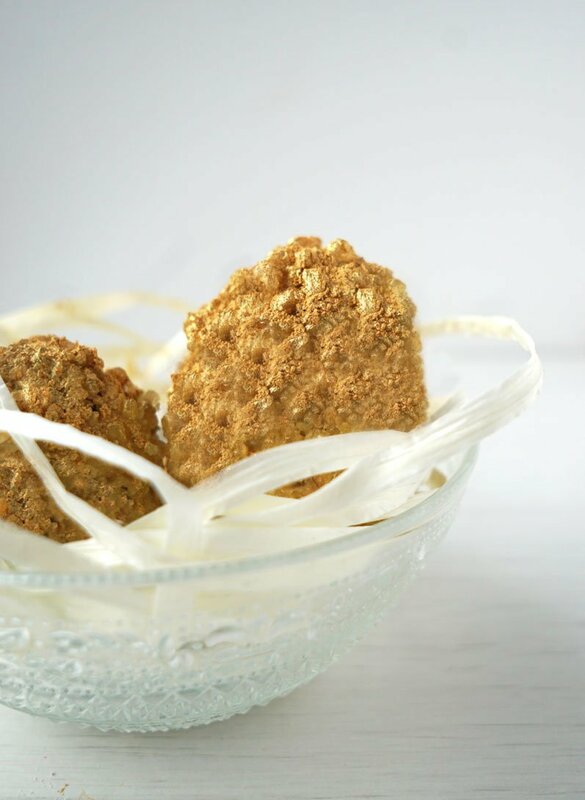 That’s the best way I can describe these DIY Golden Egg Bath Bombs. 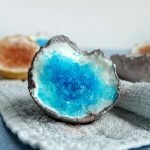 This tutorial was inspired by the DIY Glitter Egg Bath Bombs I shared last year (or was it 2 years ago already?). Combine the baking soda, citric acid and corn starch in a bowl and stir well with a spoon or whisk to mix all the dry ingredients. Divide the mixture over several smaller bowls. Add a different color of liquid soap coloring to each bowl. I used 4 colors in total. Keep stirring the mixture until the color in each bowl is divided evenly for each batch. Once you’re happy with the color, check for each batch if the mixture sticks together. Take some between your fingers and squeeze. If it stick together like wet sand, it’s ready. If the mixture falls apart, add a little bit of liquid to each batch. 1 teaspoon or even less per batch should be enough. 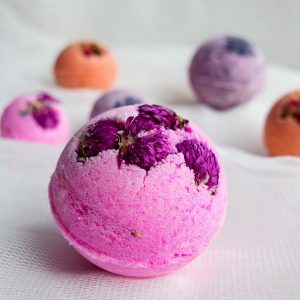 Once the bath bombs are ready you can carefully take them out of their molds. 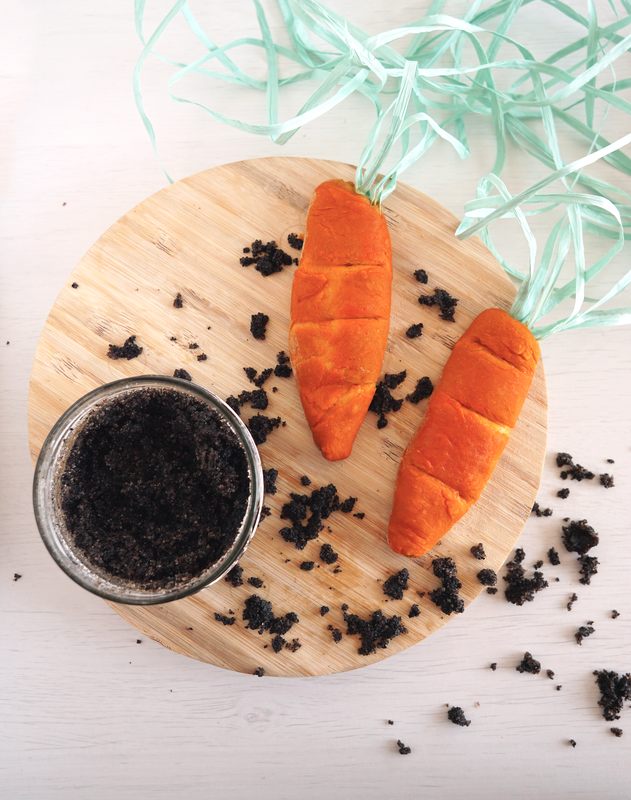 The next step is to coat the outside of each easter egg bath bomb with a layer of Shea butter. You can melt the Shea butter a little in the microwave, just enough to soften it. Or you can melt it all the way, like I did. I also added a little bit of gold lustre to the melted Shea butter. Once it’s melted, set it aside to let it cool down again. As soon as your Shea butter looks and feels like a soft butter, you are ready for the next level. 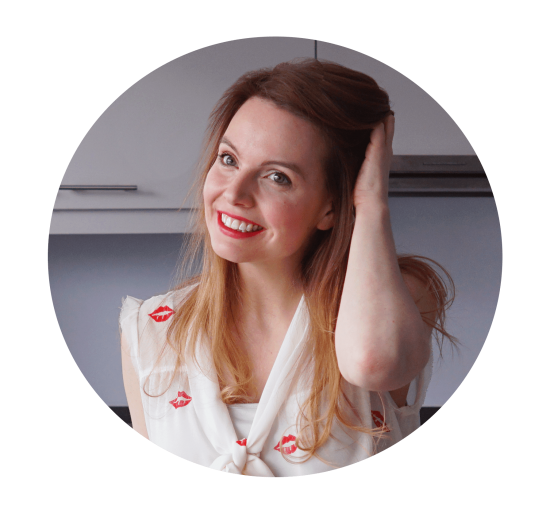 Smear a layer of Shea butter all over each Easter egg. I used my fingers for this. In a separate bowl melt 3 tablespoons of coconut oil. Add a pinch (about 1/4 teaspoon) of gold edible glitter lustre to the melted oil and stir to evenly color the entire mixture. Add about 6 tablespoons of coarse sea salt or epsom salt to the golden oil and stir to evenly coat the salts with the oil. Scatter the coated salts on a plate. 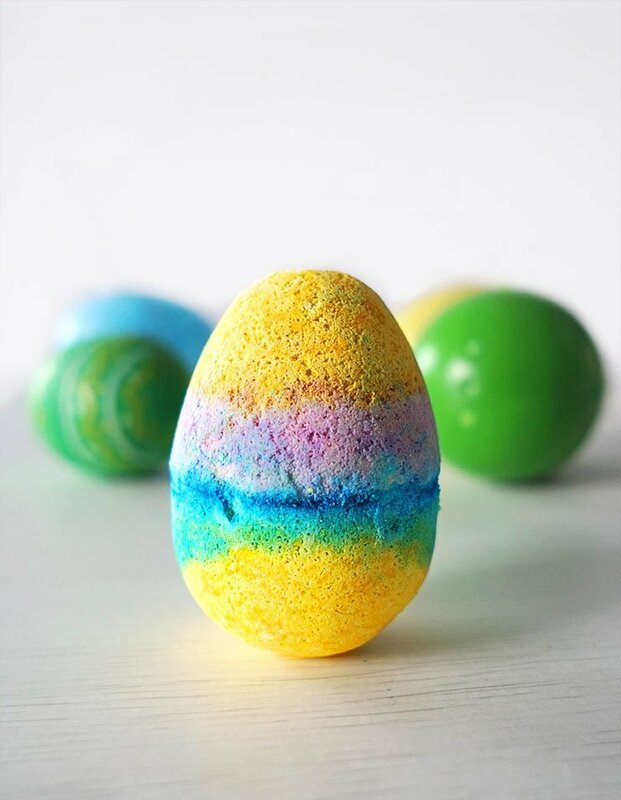 Roll each easter egg bath bomb in the bath salts. The coconut oil and Shea butter should make the “glitter” bath salts stick to the outside. Don’t be afraid to really pat the bath salts on to the bath bomb. 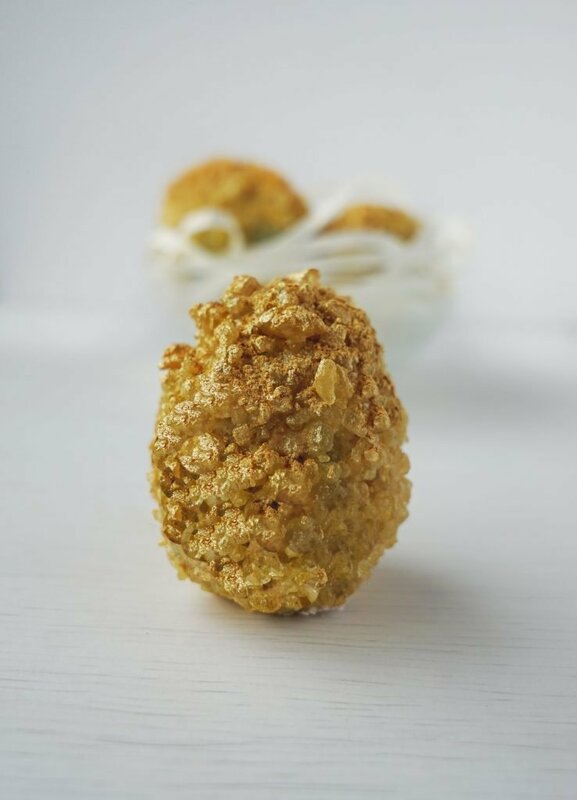 As a finishing touch you can dust some more glitter dust on top of the DIY Golden Egg Bath Bombs.